This Sunday afternoon I finished hike number 12/52 for the 52 Hike Challenge in 2015, and have now completed 96 of my goal of 1000 miles for this year. 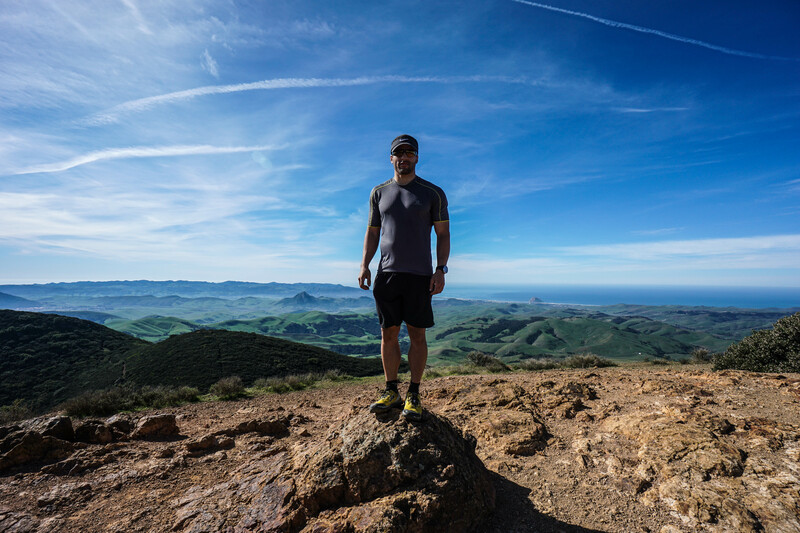 After enjoying a lot of hiking over the weekend in Shell Beach, San Luis Obipso, and Montana de Oro, I wanted to visit Morro Bay and take a short hike in the area. Cerro Alto Peak fit the bill, as it was close by, dog friendly, and offered great views of the bay. The hike to the summit of Cerro Alto gains 1600 ft over 2 miles for a 4 mile out and back trip. There is a less steep variation that tacks on some extra distance, but we took the more direct route. The trail head can be reached at the end of Cerro Alto Road, which is the road for the Cerro Alto Campground as well. It takes about 15 minutes to reach the parking lot for the trailhead from Morro Bay. The first mile of the hike is absolutely gorgeous, with lots of tree cover and leaves underfoot. Isla and Lilly were really excited to be hiking, and turned into sled dogs as soon as we started moving. One thing that’s near impossible to write about in regards to hiking, is the way it smells. The combination of sage, ocean air, and other olfactory stimuli were heavenly. After about a mile of hiking we caught our first glimpse of the Cerro Alto summit. The sun was out in full force with a slight breeze and clear skies on this day, perfect hiking weather. One of the things I miss most about living on the Central Coast is how green everything is. We just don’t get this kind of greenery in Southern California. As we continued to climb and near the summit, we could see Morro Bay, and Montana de Oro. I also got a nice view of the Ridge Trail that breaks away from the Cerro Alto Trail just shy of the summit. I’d love to continue on and see how far that would take me the next time I’m in the area. After two miles of steady uphill hiking, we reached the summit of Cerro Alto and enjoyed 360 degree views of the Central Coast. Good luck on achieving your goal! Beautiful scenery on this hike! Awesome hike! I can’t wait to get back out there myself. It’s a great one! Have fun!